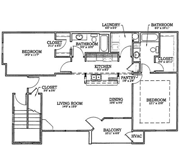 We have two floorplans available, and look how HUGE they are! 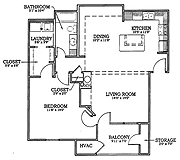 Our spacious one and two bedroom apartments offer the largest square footage of any of our communities in Lawrence. We pamper you with open floorplans, large rooms, a walk-in closet in every bedroom, and extras that include ceramic tile floors, ceiling fans, and a washer and dryer of your very own. Experience the luxury of Tower Properties Lawrence at Briarwood for yourself!